This lovingly restored 3-BR apartment in the historic of the Umbrian town of Città di Castello offers all the quality, comfort and facilities of a real home and is ideally located for touring central Italy. The property is on two floors. On the lower level, the entrance hall opens into a spacious living room, while French windows lead from the large independent kitchen and dining area onto a small terrace with a table for al fresco breakfasts. The master bedroom and main bathroom are on this floor. Upstairs, in converted attic space, is a small bathroom and two bedrooms - one with two single beds and one with a comfortable double sofa bed. This room, which can be used as a study, leads out through large glass windows onto a lovely large terrace with views over old-town roof tops to the town's spectacular round tower and to the hills beyond the ancient city walls. Città di Castello is a relaxed Italian town with much to see, great restaurants and surrounded by fabulous countryside. High-quality decoration, furnishing and equipment: The apartment is beautifully and creatively decorated, and furnished with high-quality pieces collected during our travels in Asia and Italy. The space is full of character, retaining a variety of exceptional old floors, from terracotta tiles to intricately decorated stonework. The old wooden beams remain in place, along with original doors and other fixtures. - The living room has a large comfortable sofa and two lovely old Chinese rocking chairs, as well as a 32' flat-screen TV, a DVD player, a HiFi, and a good selection of CDs, DVDs and books. - The kitchen is equipped with an oven and four gas rings, along with a dishwasher and washing machine. Here you will find everything you need for cooking, serving and eating civilized meals at home. Central, quiet location: The apartment is both very central and very quiet - just two minutes walk from the main square of Città di Castello old town in a little cobbled side street full of colourful geraniums. The terrace on the other side of the building overlooks some lovely leafy gardens, heightening this down town apartment's feeling of peace and tranquillity. In any case, Città di Castello is hardly a noisy place, but rather a quiet, authentic rural Italian town where you can escape the tourist trail and enjoy the slow pace of life with lazy breakfasts and long lunches in the many restaurants serving fresh, delicious Umbrian food. Città di Castello is a town with a deep sense of culture, from its refined architecture, its fine municipal art gallery and its beautiful, active 17th-century theatre. There is a steady stream of cultural events throughout the year, such as the Festival delle Nazione. The town is also a good base for the internationally acclaimed Umbria Jazz Festival in Perugia every July. Other FAQs: - Parking in the old town centre is restricted to residents, but you can drive you car to just underneath the apartment to unload bags, before moving the care to a free, safe car park outside the old town walls, a few minutes walk from the property. - The apartment is 10 minutes walk from the train station and two minutes walk from the bus station. Trains go north to Sansepolcro and south as far as Perugia, where the local line connects with the national network. - There is an Avis car rental office in town, 10 minutes walk from the apartment. - A number of international airports are within striking distance of Città di Castello. The nearest is Umbria International Airport at Perugia, which offers free parking, twice-daily flights to Milan and five weekly Ryan Air flights to Stansted Airport in the UK. It is a short taxi ride from the airport to Ponte San Giovanni train station, which links to Città di Castello. Other useful airports include Ancona, Rimini, Pisa, Rome and Bologna. - The main bathroom is on the lower floor of the apartment, with bath and shower, toilet, basin and bidet. - The second bathroom, with toilet and basin, is upstairs. There is a fire-place in the kitchen but it is not to be used. There is Wifi internet. Usage is limited to 1GB/day so fine for general use but not for streaming or game-playing. Dining table is in the kitchen. There is a large balcony/small terrace off the kitchen. 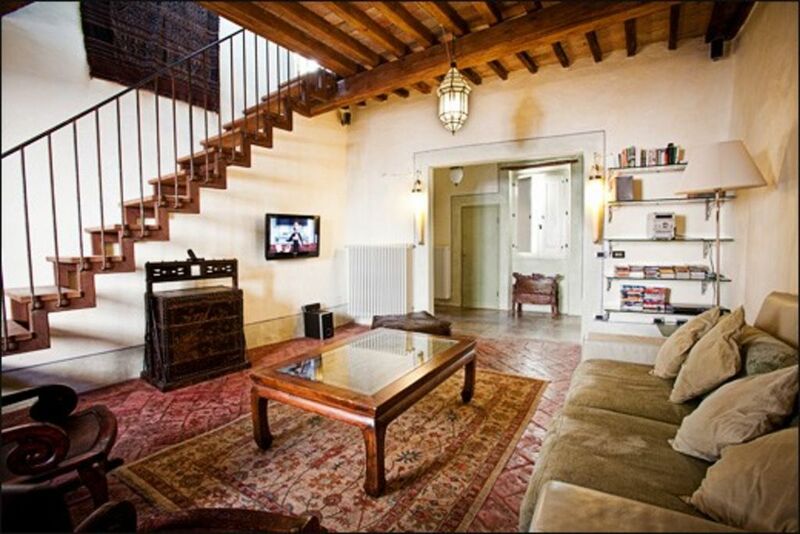 There is a lovely 10sqm terrace with garden/roof-top views on the upper floor of the apartment. A very nice apartment with a great terrace ! We thoroughly enjoyed our stay in the apartment. It is very spacious and has everything you need for a comfortable visit. It is very centrally located, in easy walking distance of everything. The car parking was free convenient and safe, making it very easy to get in and out of town for day trips to other locations. It is a beautiful area. The apartment has a great upper terrace with a wonderful view. There's also a second bathroom upstairs. The apartment is quiet, you wake to the sounds of birds singing, not traffic. The kitchen is well-stocked - note however it does not have a microwave. We highly recommend this apartment ! Thanks so much for your review. I am delighted you enjoyed your stay! A beautiful and comfortable old apartment centrally located for restaurants, marketing, and shopping. Close to free public car park so sightseeing was easy. Managed by a lovely English-speaking woman who lived nearby and was eager to help with small questions. My family (2A, 4C) stayed at Tiffany's last December for 3 fabulous weeks. The apartment was in a secure apartment block. It is located a few minutes walk to the center of the old town and a few minutes walk to the school. The car park is less than 10 minutes walk. The apartment itself had a fabulous feeling, very clean and exceptionally well-appointed. Everything worked from the stove and dishwasher to the heater and hot water to the TV, CD player and internet. Seriously, we have absolutely no complaints. We felt like family when Lia met us and helped us with absolutely everything. Although we didn't meet Tiffany, she was quick to answer our emails and easy to work with. If only more properties were managed as well as this one. I have recommended Tiffany's fabulous apartment to all my Australian friends and family. Lovely apartment in a lovely town! I stayed here with a group of friends in July and it was lovely! The apartment is really well kept and spacious with a great roof terrace. It was great to stay in an apartment as the Italian's would rather than a purpose built villa! Citta di Castello is a fantastic town and a great base - the restaurants and cafes start a stones throw from the house but you still feel out of the way of it all. Myself and my friends all want to go back at some point and I'd also like to visit again with my husband and two children. Highly recommend it! Great Apartment in historic centre. We had a perfect vacation in Citta di Castello. The apartment was very well equipped and kept everything that was promised on the website. The terrace has amazing views over the hills and the countryside. Upon arrival we were met by Tiffany who provided us with everything we needed to know about the city and the surroundings, and gave an altogether excellent service. Citta di Castello is full of nice restaurants and small shops, so one can easily use a day or two here, and when you want to explore some more of Umbria or Tuscany the city is within easy driving range of Arezzo, Perugia and Spoleto among others. We would definately recommend this to other travelers wishing to explore this part of Italy. Nous avons séjourné avec nos deux enfants pendant quatre jours dans cet appartement confortables et décoré avec goût. En plein centre de la ville, nous avons pu profiter des nombreux restaurants et commerces situés à proximité. Nous avons aimé les pièces spacieuses, la terrasse sur les toits (avec ses pigeons) et l'équipement disponible (musique, TV, wifi...). Città di Castello is a beautiful walled Umbrian town on the banks of River Tiber, near this central Italian region's borders with Tuscany and Le Marche. The cobbled streets of the historic centre are bright, open and full of charm, with a strong Renaissance influence from Florence softening the austerity of the town's medieval past. There is plenty to explore within Città di Castello, as well as many wonderful bars and restaurants in which to enjoy the slow pace of life sipping a glass of prosecco or savouring some delicious Umbrian flavours. Città di Castello is ideally located for exploring some of central Italy's key sites by car, train or bus. Perugia, Florence, Assisi, Spello, Spoleto, Gubbio and Urbino are all easy day trips. It is an hour's drive to the beach or to our local ski station and 2.5 hours drive to Rome. The green, unspoiled countryside, surrounded by the Apennine mountains, is perfect for hiking, biking, horse riding, golf, canoeing and other outdoor activities. Golf: Fattoria Caldese is a golf club and resort five minutes drive outside Città di Castello. Ski: It is possible to ski at Monte Nerone, an 1,500m Apennine mountain about one hour's drive from Città di Castello. The mountain has one ski lift servicing five blue and red pistes as well as a convivial and well-run chalet with a bar and restaurant with good hearty food cooked fresh in the kitchen over an open fire by a group of local ladies. There is also a glowing stove and plenty of wicked mulled wine to be had at the bar. Monte Nerone may not be quite Cortina, but it makes for a fun day trip. Skis can be hired at Scarselli Sport in Città di Castello, or Pupita Sport in Piobbico at the base of the mountain. - Our changeover day is flexible, but most rentals run from Saturday to Saturday. - Discounts are considered in all periods for stays of more than 2 weeks. - The extra night rate will be less if you have stayed at least 7 nights (calculated pro-rata from the weekly rate). - For long-term stays (of a few months or more), I can offer a discount on the 'monthly' price. - Fyi my high-season (Spring-Summer) and low-season (Autumn-Winter) rates are now the same. I used to charge a lower rental in the colder months, but added a flat weekly fee to cover (substantial Italian) heating costs. The heating fee is now included in the winter price. (Please do go easy on the heating). - Pets are at my discretion - I am happy to host small, well-behaved, house-trained, clean, non-shedding, non-chewing pets in the apartment. If you are not sure if your pet meets these requirements, please contact me before booking.